Intense. Scary. Dangerous. Scarring. Real. All the words that describe the duty of a soldier. To most people back home, when a loved one leaves again, they must think the person goes because they think they owe it to their country. But I think that soldiers do it for a whole different reason. The first important scene in American Sniper is when the main character, Chris Kyle, and his younger brother are getting a talking to at the dinner table. In elementary school at the time, Chris’ younger brother was getting beaten up, so Chris defended him; he taught the bully a lesson… with his fists. Now, you might think that they were getting scolded, but their father was actually giving them praise. He said to protect brothers, blood-related or not. He was teaching them to protect and fight for the ones they loved; to be loyal. When Chris is in his late twenties, almost 30 years old, he fully understands what his father told him all those years ago and enlists. He starts training and then becomes a Navy Seal. The category he is placed in is sniper shooting and judging by the name of the movie, you can tell he is the best at his job. He deploys on four total tours as “The Legend” before he stays home for good. But through those four tours, he watches innocent people die. He watches a young boy get a drill through his thigh, then his head. He watches that same boy’s father get shot multiple times trying to run to his dying child. He sees fellow soldiers get shot down by enemy guns and is with some best friends as they die from fatal wounds. Cooper’s rendition of playing a mentally and emotionally scarred soldier on the verge of giving up after seeing and going through all those horrid things is so real. He presents to us such raw emotion by just sitting in a chair staring at a blank TV screen while we are inside his head listening in on the sounds of bombs, bullets, the dying. Cooper’s terrific acting allows us to become the character right alongside him. Kyle sees all of these things when on duty, but also back home. He hears the sound of bullets ringing through the air, hears drills whirring, hears the screams of dying children through all hours. He hears, sees, and remembers it all. But that’s exactly the reason why he went back to it again and again: to end it. To end all the killing, the endless screams, the war. And that’s precisely what he does. From over a mile away, “The Legend” kills the enemy sniper who the military has been trying to catch for almost four years. After that, he goes home. He goes home to his wife and kids and doesn’t leave again because he knows that he avenged everyone. He knows that he made their deaths become justifiable. He knows that he was loyal and stood right through it all, just like his father taught him. I’ve heard many people saying that this movie is Bradley Cooper’s best in his career, and I couldn’t agree more. His performance makes you feel like you’re Chris Kyle, going through everything that he went through. Cooper’s pure passion for this role was intensified when he actually put on 40 pounds of muscle to not only look the part, but become the part. When an actor is that invested, you know it will be a great movie, and in my view American Sniper is the best movie of the past few months. But others don’t think so. 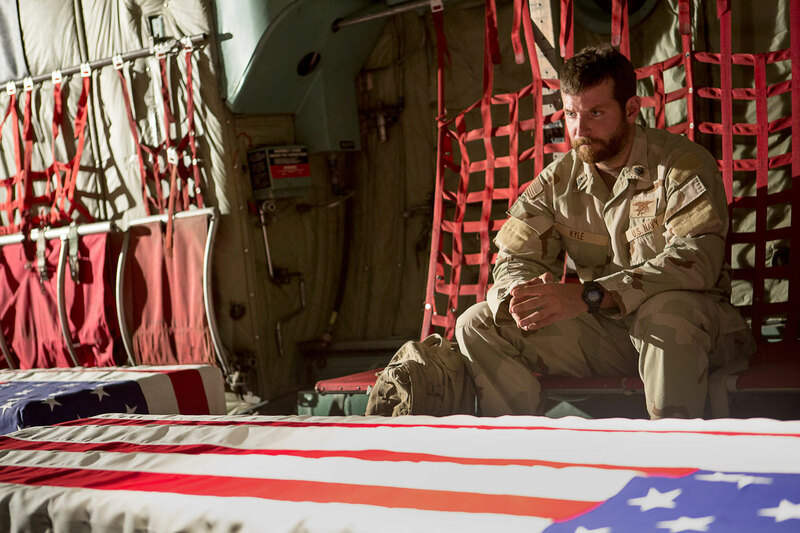 On the radio one morning, I heard a conversation about American Sniper. What I heard shocked me. It surprised me to hear that people are hating on this movie for a reason that I did not even think about. Some people believe that this heart-wrenching movie is glorifying war, and claiming that it unsettles them. I have to disagree with their argument, however. I think that instead of glorifying war, the actors portraying their characters are saying to protect your friends, your people, and your country at all costs—even if it means enduring the horror of war. Movie Musings is a regular movie column written by Amber Olson, Current Staff. Nice job summarizing this movie, Amber, and I agree with your take on it. The movie does not glorify war as much as it takes the viewer through one man’s conflicted journey as a soldier, husband and father. Stunning performance by Bradley Cooper. Please remember that it is just a movie. The discrepancies in the movie are overwhelming compared to his own biography and other stories from people that were actually there. Why does Eastwood change who Kyle really was? The movie is a feeble attempt to capture who Chris Kyle was and how disturbed war made him. Why can’t Eastwood show us the truth of Kyle’s life and let the viewer decide what kind of person Kyle was and whether he truly was a hero. I have two friends that are retired Navy SEALS and they thought the movie was insulting on many levels. Look up all the liberties Eastwood took to describe Kyle, and then write your review. Because two Navy SEALS were insulted that makes this a bad movie? Many other SEALS have been in the public eye praising the film. Their opinions count too. So what is the truth of Kyle’s life then? Bradly Cooper was given hundreds of hours of video footage (many of it personal) by Kyle’s wife so he could study it. She also turned over all of their email correspondence while he was deployed. From all this they got everything wrong? Perhaps there’s just a little anti-military bias here. Kyle’s wife has given many interviews that say the movie got it right. I’ll go with the opinion of somebody who actually knew him. To call this a “feeble” attempt is ludicrous.